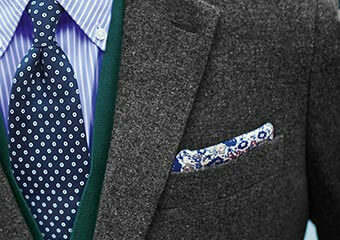 The pocket square is one of the easiest and most stylish ways a man can accessorise. Not only does it make you look elegant and sophisticated, a pocket square also injects a dash of personality and individual style to your outfit. It’s the perfect way to finish off your suit with a flourish, or add a splash of colour to your jacket. 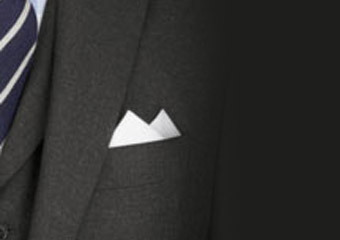 Here are our five favourite ways to fold a pocket square. Use a pure silk handkerchief for the smartest effect. This is the easiest way to fold a pocket square. Fold your handkerchief in half twice so it forms a square, then in half again via the points so it forms a triangle. Next fold in the two long opposite points of the triangle. Tuck the pointed end into your jacket pocket so only the straight edge shows. 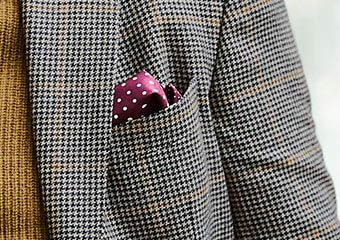 This is a variation on the square pocket square. Simply fold your handkerchief in half twice to form a square, then half again as above so it forms a triangle. Again, fold in the two long opposite points of the triangle. Instead of leaving the straight edge showing from your jacket pocket, simply turn it around so only the top of the triangle is showing. 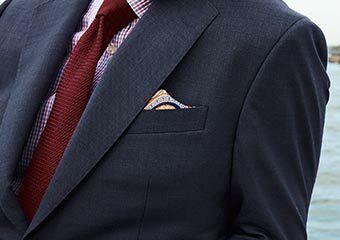 Fold your pocket square in half twice so that it forms a four and one-half inch square. Lay it on a flat surface with one corner pointing up and one corner pointing down, like a diamond shape. Fold the bottom corner up so it sits on the left of the top corner, to form what looks like two mountain peaks sitting side by side. To finish, fold the left side and the right side in towards the middle. Tuck this straight end into your pocket. Fold your handkerchief in half twice and lay it on a flat surface. Next, pinch the middle of the square and lift up. Tuck the excess fabric into your jacket pocket and leave the pointed edge showing. 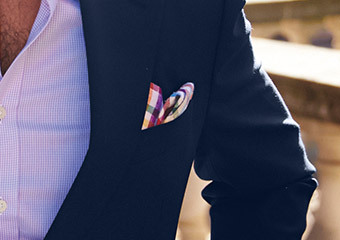 This is an upside-down puff pocket square. You simply create the puff pocket square as above, but instead of tucking the excess fabric into your jacket pocket, leave it hanging out. This pocket square gives a more casual effect.